The de Havilland DH.98 Mosquito is a British twin-engine shoulder-winged multi-role combat aircraft, introduced during the Second World War, unusual in that its frame was constructed almost entirely of wood. It was nicknamed The Wooden Wonder, or "Mossie" to its crews. Lord Beaverbrook, Minister of Aircraft Production, nicknamed it "Freeman's Folly", alluding to Air Chief Marshal Sir Wilfred Freeman, who stoutly defended Geoffrey de Havilland and his design concept against orders to discontinue the project. In 1941 it was one of the fastest operational aircraft in the world. Originally conceived as an unarmed fast bomber, the Mosquito's use evolved during the war into many roles, including low to medium-altitude daytime tactical bomber, high-altitude night bomber, pathfinder, day or night fighter, fighter-bomber, intruder, maritime strike aircraft. It was also used by the British Overseas Airways Corporation (BOAC) as a fast transport to carry small, high-value cargoes to and from neutral countries through enemy-controlled airspace. The crew of two, pilot and navigator, sat side by side, but a single passenger could ride in the aircraft's bomb bay when necessary. The Mosquito FBVI was often flown in special raids, such as Operation Jericho – an attack on Amiens Prison in early 1944, and precision attacks against military intelligence, security and police facilities (such as Gestapo headquarters). On the 10th anniversary of the Nazis' seizure of power in 1943, a morning Mosquito attack knocked out the main Berlin broadcasting station while Hermann Göring was speaking, putting his speech off the air. The Mosquito flew with the Royal Air Force (RAF) and other air forces in the European, Mediterranean and Italian theaters. The Mosquito was also operated by the RAF in the South East Asian theatre and by the Royal Australian Air Force (RAAF) based in the Halmaheras and Borneo during the Pacific War. During the 1950's, the RAF replaced the Mosquito with the jet-powered English Electric Canberra. The FB Mk VI, which first flew on 1 June 1942, was powered by two, single-stage two-speed, 1,460 hp (1,090 kW) Merlin 21s or 1,635 hp (1,219 kW) Merlin 25s, and introduced a re-stressed and reinforced "basic" wing structure capable of carrying single 250-or-500-pound (110 or 230 kg) bombs on racks housed in streamlined fairings under each wing, or up to eight RP-3 25 lb or 60 lb rockets. In addition fuel lines were added to the wings to enable single 50 imp gal (230 l) or 100 imp gal (450 l) drop tanks to be carried under each wing. The usual fixed armament was four 20 mm Hispano Mk.II cannon and four .303 (7.7 mm) Browning machine guns, while two 250-or-500-pound (110 or 230 kg) bombs could be carried in the bomb bay. Unlike the F Mk II, the ventral bay doors were split into two pairs, with the forward pair being used to access the cannon, while the rear pair acted as bomb bay doors. The maximum fuel load was 719.5 imperial gallons (3,271 l) distributed between 453 imperial gallons (2,060 l) internal fuel tanks, plus two overload tanks, each of 66.5 imperial gallons (302 l) capacity, which could be fitted in the bomb bay, and two 100 imperial gallons (450 l) drop tanks. All-out level speed is often given as 368 mph (592 km/h), although this speed applies to aircraft fitted with saxophone exhausts. The test aircraft (HJ679) fitted with stub exhausts was found to be performing below expectations. It was returned to de Havilland at Hatfield where it was serviced. Its top speed was then tested and found to be 384 mph (618 km/h), in line with expectations. 2,298 FB Mk VIs were built, nearly one-third of Mosquito production. Two were converted to TR.33 carrier-borne, maritime strike prototypes. Mosquito FB Mk VIs of 143 Squadron were engaged by 30 Focke-Wulf Fw 190s from Jagdgeschwader 5: the Mosquitos sank an armed trawler and two merchant ships, but five Mosquitos were lost (two reportedly to flak), while shooting down five Fw 190s. 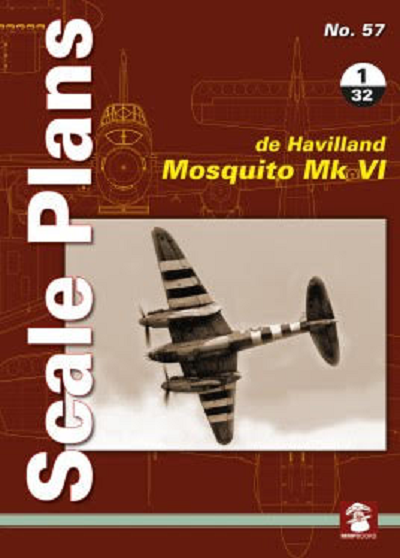 The cover art shows a black and white wartime photo of a Mosquito Mk. VI in flight. It is showing its dark bottom and D.Day Invasion stripes under it's wings and around the rear of the fuselage. This photo is on a brown background that has a yellow line-drawing of the front and top of a bomber that I cannot identify. The back cover is also all brown with a yellow line-drawing of the landing gear and top of a Stuka. The folder contains 3 long sheets that are 30" long. They are folded 3 times along that length to create 8 pages each in 8 1/4" x 11" page format. The first sheet has been accidentally double-glued to the cover of the folder. I had to take a scissors and cut that second adhesion loose, so the sheet would unfold. This first sheets face side has a side view and fuselage inner frames of a Mosquito F.B. Mk. VI. The reverse side has a side view of the F.B. Mk. VI II series, late production Mosquito, mainly used by Coastal Command units and a II series equipped with A.I. Mk. XV radar. the second sheet face side has an illustration of the II series top view. The reverse side shows an illustration of the II series bottom view. The third sheet face side has two front views of a II series. One with wheels up and one with its wheels down. The reverse side shows a Mosquito F./N.F. Mk. II as 2 side views with radar, but one with long exhausts with heat resistant panels and modified intake guards. I want to thank Casemate publishers and Dr. Roger Wallsgrove head-editor of MMP for this book sample.